Thanks to a Christmas gift from my wife I recently rediscovered the joy of a childhood hobby. I could go on and on, but I’ll cut it short and put it to you this way – if you don’t have a microscope go out and get one right away! You will not regret it. You and your children will be instantly delighted and fascinated by the exotic world that exists just out of our sight. Scoop up a tiny bit of pond water, put a few drops on a slide, and focus your lens. It is truly like peering into a strange new world populated by a host of unique creatures. We tend to think of microscopic animals as mindless bacteria or “germs” that simply exist in blobs of stagnant water. But when you see these myriad shapes spinning around, stretching, squirming, flashing like bullets and going about their lives amidst a jungle forest of algae you’ll have a different opinion. There are predators in this microscopic forest searching for prey. You’ll see internal organs pulsating in transparent bodies, flashing antenna, tiny clawed feet, dark black eyes, shapes that change like magic. It is a show like nothing else on earth! And that is not all. Although the wonderfully strange animal life is the main attraction the myriad geometric shapes and color of the plant life is a worthy show as well. Some of these shapes are so odd they look like computer generated cartoons instead of actual living organisms. So don’t delay – get your microscope today. Pictured here are a few of the common microscopic species that inhabit pond water. What appears to be staring back at you with a pair haunting black eyes is a water flea. 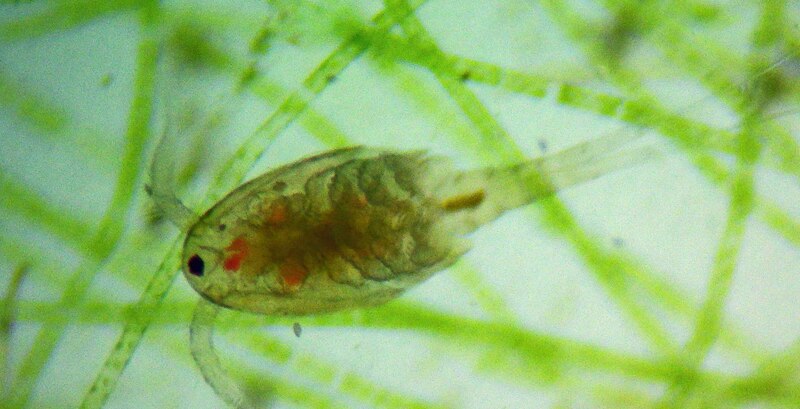 This is actually a crustacean; in this case likely Daphnia pulex. Not readily apparent in this photo but very visible under the microscope are the large waving antenna used for locomotion and feeding. 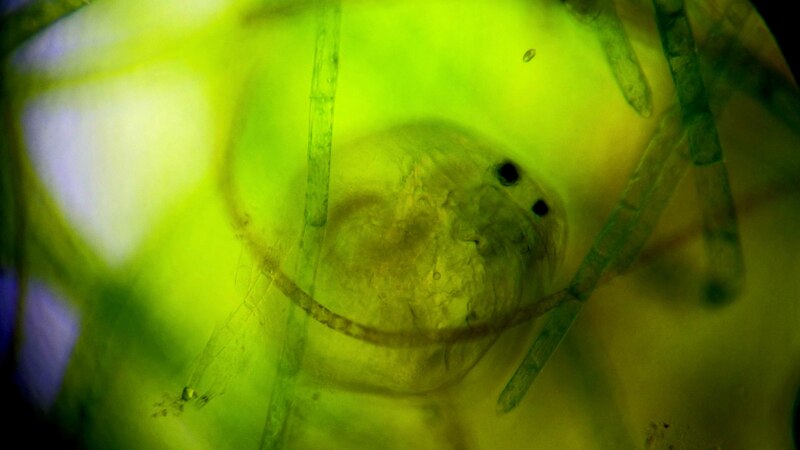 Then we have a single eyed crustacean very appropriately called a cyclopoid copepod, Macrocyclops aldibus. 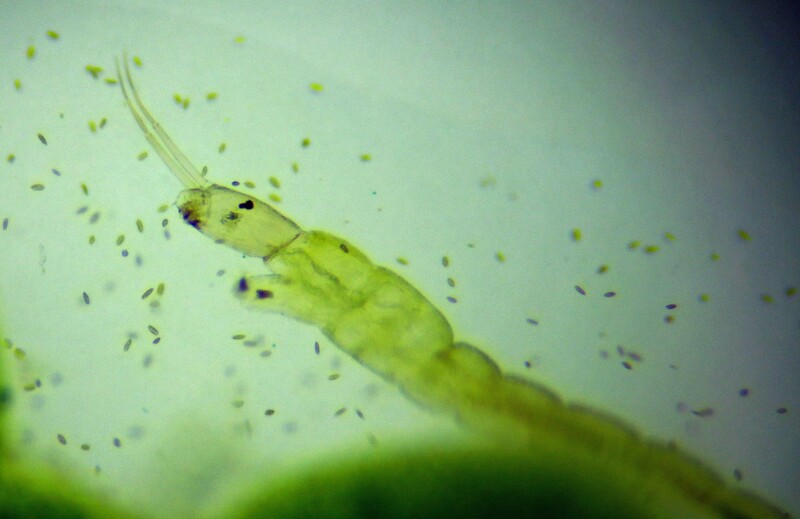 Next up in the microbial pond water population is a midge fly larvae of the Chironomdiae family. From the research I have done this one appears to be a non-biting midge, distinguished by the pair of antenna jutting out from the animal’s head. I have not yet identified the tiny creatures swarming around it but they are very numerous and very fast moving.